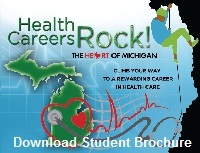 Health Opportunities for Today and Tomorrow (HOTT) is a non-profit health care career guide for Michigan students, connecting students with a pathway to a health care education and career. The HOTT program is produced and supported by the Michigan Health Council. This site offers tools to help job seekers, students, businesses and career professionals browse/explore occupations and careers, search job openings and salaries/benefits, find information on education requirements and training, explore resources for good resume building and interview skills, etc. This website offers information on a variety of health careers including job descriptions, salary information, educational requirements, and job outlook. This site provides a reliable and comprehensive source of accurate up-to-date information about the health professions. This includes information on and links to health-related education/training programs, financial aid resources, specialized learning opportunities, and current issues in health care. Loan reimbursement programs are available for individuals interested in primary care in Healthcare Provider Shortage Areas through the National Health Service Corps, for Native Americans and Alaskan Indians through the Indian Health Service, and for Registered Nurses that want to work in underserved populations.